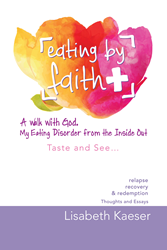 A two-time survivor of anorexia courageously shares her struggle and journey of healing in new book, "Eating by Faith"
We use food and our bodies to say what our voices can not. It’s time to break the silence. Eating disorders impact millions of men and women of all ages every year. For Lisabeth Kaeser, anorexia impacted her life as an adolescent and then again as a middle-aged woman. Kaeser bravely shares her unique story in hopes of providing awareness of what she considers an “ugly” illness. Her new book, “Eating by Faith,” provides an inside look at living with anorexia and the challenges of recovery in a brutally honest and raw way. While eating disorders are different from person to person, she emphasized how they share a commonality of symptoms physically, emotionally and spiritually. After years of wrestling with her illness and being angry with God, Kaeser took a leap of faith to find her true identity in the love of God instead of her eating disorder. Now in remissions, she finds healing in God’s unconditional love. “I believe if people see that God loves me just as I am, flaws and all, then maybe my story will encourage others to turn to him instead of food, drugs or self-loathing,” Kaeser said. Currently Kaeser works with the Tri-State Eating Disorders Resource Team where she speaks about eating disorder recovery and prevention and facilitates The Body Project – a program for high school and college women that aids in the prevention of eating disorders. For more information, visit http://www.eatingbyfaith.com. Lisabeth Kaeser was the keynote recovery speaker for the Greater Cincinnati 2015 National Eating Disorders Association (NEDA) Walk and was an honored speaker for the Ohio State University’s Inaugural Project Heal Gala. Active in healing ministries, she speaks to Christian based and secular organizations about prayer and inner healing. Kaeser is a Hanover College alumna who has been married for 30 years. She and her husband have two sons, a daughter-in-law and one granddaughter.